Medalists from left Gabrielle Yurik, Hailey Hrynewich, Allyson Geer. 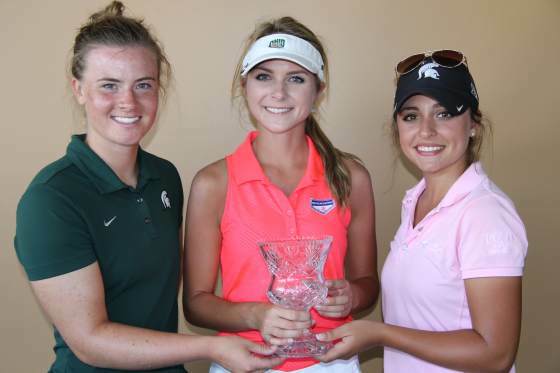 SPRING LAKE – Allyson Geer of Brighton, Hailey Hrynewich of Muskegon and Gabrielle Yurik of Oakland Township shared medalist honors Tuesday and will lead the field into match play at the 99th Michigan Women’s Amateur Championship at Spring Lake Country Club. Yurik, 20 and a senior-to-be at Michigan State, shot even-par 72 for an even-par 144 total. Geer, 16 and a medalist for the second consecutive year, shot 74 to match. And Hrynewich, 20, the 2013 runner-up and a junior-to-be at Ohio University, shot 74 to make for the three-way medalist honors. A blind draw gave Hrynewich the top seed, Yurik the second seed and Geer the third seed. Match play starts at 8 a.m. Wednesday and a “Sweet 16” will be determined by the end of the day. Two rounds of matches on Thursday and two more on Friday will determine a champion. Local high school favorite Anna Kramer, whose parents are Spring Lake members, shot 72 for 145, just out of the medalist mix. Grand Valley State golfer Gabrielle Shipley of Hastings, who shot 75 for 146, rounded out the top five. Former Grand Valley State standout Sarah Hoffman of Saline, who shot 73 for 147, University of Tennessee golfer Hanna Pietila of Brighton, who shot 77 for 149, Oakland University golfer Alyssa Albright of Lansing, who shot 75 for 150, Tennessee golfer Emmie Pietila, who is Hanna’s sister and shot 80 for 150, and Cordelia Chan of Birmingham who is headed to Williams College (Mass.) and shot 78 for 152, rounded out the top 10. Three golfers played off for spot 32, the final spot, at 160. Priscilla Harding of South Lyon took the spot with a par on the first playoff hole and will meet Hrynewich in the first match off No. 1 tee. Yurik, who six years ago at age 14 made a run to the semifinals, said she was happy about being medalist. Yurik, who has played little golf this summer because of an internship, said she likes match play. Geer, who shared the first-round lead with Hrynewich and Emmie Pietila, said she struggled in her round. “It was kind of a grinding round, but I was able to make putts when I needed to,” the home-schooled 16-year-old said. Geer, who committed to Michigan State golf at age 14 and will be in the 2017 class, said she was happy about being a medalist for the second consecutive year and looking forward to match play where she reached the quarterfinals a year ago. Hrynewich called her second round a struggle as well. She said the course played easier in round one and noted that the wind picked up to help make a difference. “Today was a bit frustrating, but I made putts when I need to make them to save par,” she said. She was excited about being medalist, which is something her twin brother Reed, a University of Michigan golfer, also did in the Michigan Amateur Championship earlier this summer. Likewise, both where low amateurs in the respective Michigan Open Championships, and both have qualified to play in upcoming U.S. Amateur Championships. The runner-up in 2013 to Christine Meier and a quarterfinalist last year, Hrynewich knows her brother lost in match play in the men’s amateur.